See how the data on infant mortality changes! The infant mortality rate is calculated by dividing the number of infants who die within one year of birth by the number of infants who are born. The infant mortality rate is usually expressed as the ratio of infant deaths per one thousand live births. Prior to 1900, infant mortality rates of two and three hundred obtained throughout the world. The infant mortality rate would fluctute sharply according to the weather, the harvest, war, and epidemic disease. In severe times, a majority of infants would die within one year. In good times, perhaps two hundred per thousand would die. So great was the pre-modern loss of children's lives that anthropologists claim to have found groups that do not name children until they have survived a year. The early part of the Industrial Revolution may have exacerbated these conditions. Housing in factory cities was crowded, dirty, unheated, and unventilated. Food supplies were unreliable, impure, and so narrowly based as to cause nutrition problems. Diseases were untreatable, sometimes even unrecognized. Without a germ theory of disease, people did not take precautions to prevent the spread of infections. But the Industrial Revolution contained the seeds of a complete reversal of the infant mortality rate. By the 1880s, "progressives" were spreading doctrines of cleanliness. Sewers were being installed in the cities. By the early decades of the 1900s, a wide range of improvements begin the drive the infant mortality rate down. Central heating meant that infants were no longer were exposed to icy drafts for hours. Clean drinking water eliminated a common path of infection. More food meant healthier infants and mothers. Better hygiene eliminated another path of infection. Cheaper clothing meant better clothing on infants. More babies were born in hospitals, which were suddenly being cleaned up as the infectious nature of dirt became clear. Later in the century, antibiotics and vaccinations join the battle. 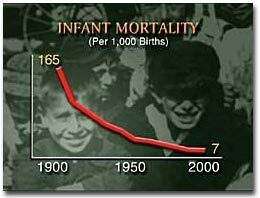 The infant mortality rate started a long slide from 165 per 1,000 in 1900 to 7 per 1,000 in 1997. The health of older children also improved. Diseases that had carried off thousands of children in 1900 were practically eliminated by 2000: diphtheria, and pertussis, measles. 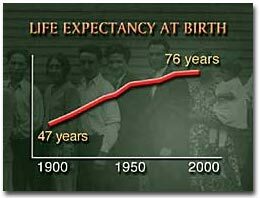 Life expectancy is the average number of years that a person would live if he or she experienced the age-specific death rates that occurred at a particular point in time. As death rates decline, life expectancy increases. Life expectancy at birth is very sensitive to reductions in the death rates of children, because each child that survives adds many years to the amount of life in the population. Thus, the dramatic declines in infant and child mortality in the twentieth century were accompanied by equally stunning increases in life expectancy. For white women, life expectancy at birth rose from 51 years in 1900 to 80 years in 1996. For white men, life expectancy at birth rose from 48 years in 1900 to 74 years in 1996.